Established in 1978, KING YUAN FU （KYF）has been known as a specialized & experienced factory for thermoforming. and sold our products to more than 30 countries and enjoy the good reputation worldwide. With the passion for innovation, we’ve awarded many patents in many countries. In processes, from product design, tooling development, sheet extrusion to thermoforming, all steps are made in house. provides the value-added advantage at the retail level. 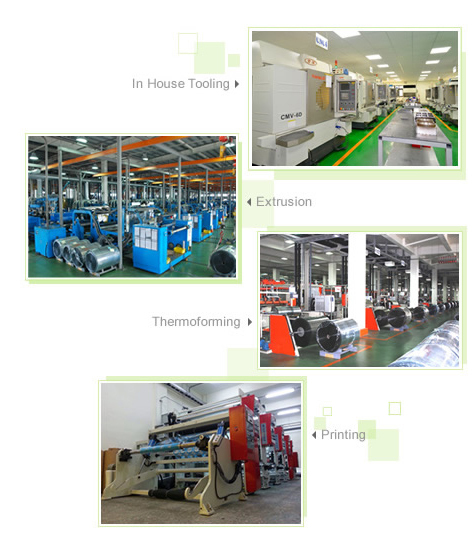 The material that we produce including regular PP, PLA, CPLA,PET, RPET and Co-Ex PET sheet. The extrusion capacity is 121,000 tons annually. Also, we are already certificated by ISO 9001, ISO 22000, ISO 14001, HACCP and BRC. Quality control processes are followed at all levels of production. and we are committed to a better environment for generations to come. KYF has invested US$85 million to build our 3rd factory located in Yilan. The 3rd factory is completed on 2016 of May and our anticipated turnover will reach USD$ 200 million annually. we have been a pioneer in this area for years. Superior Quality, Quickest Response and On-Time Delivery!